Yesterday was another day of deliveries. At the top of the picture are the second and third volumes of Dot Kareshi -We're 8bit Lovers!- and an overpriced copy of Black Wolves Saga -Bloody Nightmare-. I'm making up for lost time and playing all of the PC games I've missed over the last few years. The sole audio CD is Tadaima by Kurahashi Yoeko. 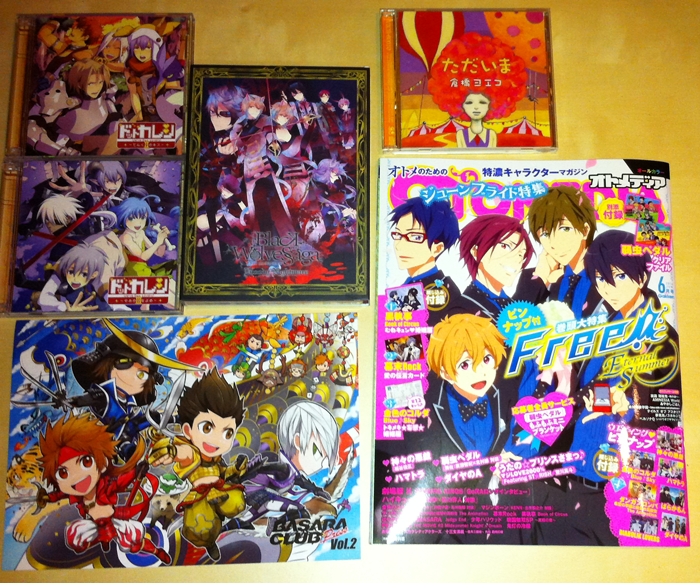 A small pile of doujinshi from the recent Super Comic City event arrived too and was omitted from the picture. I couldn't afford to buy all five mainstream anime magazines which contain Sengoku Basara: Judge End content this month so I settled for the June issue of Otomedia. 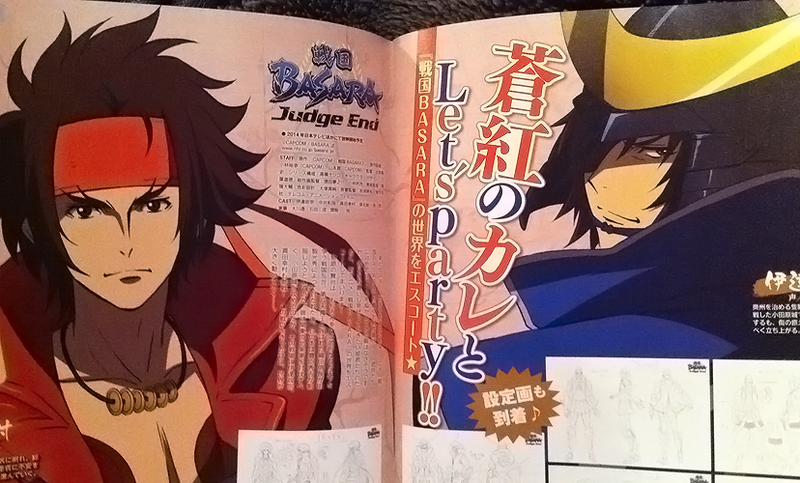 Sengoku Basara: Judge End received a two-page spread to highlight last week's news. I'm not going to make a habit of publishing content from inside magazines but here's a terrible phone snapshot as a sample. Most of the information was the same as on the official website aside from a very short Q&A with Itou Kouhei, one of Telecom Animation Film's producers and the same person who left a comment in last month's PASH! magazine. Q. What's the appeal of this anime project? A. I think that this is an anime which interprets the Sengoku Basara 3 source material from a new perspective. The story incorporates a large number of original elements. Q. Other than the four characters that have already been revealed, please tell us whether the 'key characters' who featured in the original game will remain. A. Date Masamune, Sanada Yukimura, Tokugawa Ieyasu, Ishida Mitsunari; while it was inevitable that these four would appear, the unique individuals who stand firmly by their sides all have roles to play too. I think of all of them as having become 'key characters'. One of the attractions is seeing how they'll feature, and in which scenes. Q. What will you do about fans who already have their own impressions of Date Masamune and Sanada Yukimura? A. That's a tough question... But I think that even these guys (Masamune and Yukimura) must have sides to them we don't know about. There could be some completely unexpected, unbelievable surprises. While it's unfortunate that I can't say any more about this, I think that we've taken care to look after the mental image that everyone has of each character. Apologies for my shabby late night translation. Hmm, Itou-san always makes a point of listing Mitsunari last and the key artwork seems to set him aside from the other three as well. I'm really feeling as though he'll be positioned as the main 'villain' this time for most of the show. It's interesting that the female-orientated Otomedia coverage really isn't hiding its bias towards Masamune and Yukimura. Is it really the magazine’s bias only? It seems like Masamune and Yukimura are again the two most important characters in this anime. It's no wonder that Katsuie's anime ending is number one - that ending and a certain battle before it is basically soul-destroying. After that, Sakon’s and Hanbei’s endings were nothing and quite expected. One other ending was quite crushing too though and it involved the punching of one crappily made grave. Lol’d for about 5 minutes after I got Mouri’s alt. The most amazing outfit imo is Tenkai’s. Fabulous. Really good job overall with those alts, wow. I'll try to pick up a more general-interest magazine next month to compare. Otomedia is very heavily biased towards covering content their audience will enjoy so I'm not sure I have had the most balanced coverage so far (lol). There's also the fact that Masamune and Yukimura will get more attention from casual fans of the old anime, I guess, so it makes commercial sense to put them in the spotlight again this time. I have to agree about the quality of the alts; the newsletter mentioned three more characters with popular costumes which didn't quite make the top three: Tenkai, Aniki and Kojuurou. I think Katsuie's must be my favourite since I haven't let the poor guy wear any of his other outfits ever since I unlocked it. Also, completely off-topic but since you tweeted about it - apparently Sakai Masato is going to play the lead in Sanadamaru. He's not the type of actor whom I would've imagined for this role, so I'm very curious of what kind of Yukimura he's going to be. I love how most anime/game staff members smoothly glide past any inconvenient questions in this kind of interview. Well, there's a lot of coverage next month too; they can't stay quiet forever! As someone who is greatly disappointed with The Last Party movie, and now that they said JE will be mainly based on BSR3. Now, I can hope for the angst adaptation which take more loyalty to the original story, right? I mean... I just wish that they will depict and focus on the doomed relationship of Ieyasu and Mitsunari, and everything else as they were in the game. Sorry for being sort of grumpy fangirl, but drama and tragedies are what I'm anticipating most of the upcoming JE. I just hope they get the balance right; Mitsunari's tragic story needs to be told properly without sweeping him and Ieyasu out the way like they did in the movie, but at the same time I want to see happier scenes (like Yukimura being reunited with Oyakata-sama, Tsuruhime being naiive, and anything involving Sourin). Twelve episodes should be perfect for letting the East and West armies built up to a climactic fight without sacrificing too much from the story if all goes well.